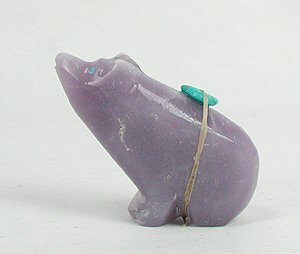 Flourite bear with turquoise inlaid eyes and turquoise medicine bundle. Jimmy Yawakia's work is featured in Zuni Fetishes and Carvings by Kent McManis. 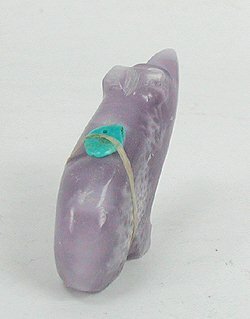 Fluorite is the natural crystalline form of calcium fluoride (CaF2). 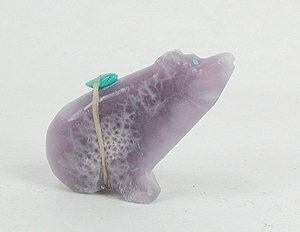 The name comes from the Latin "fluere" which means to flow. The most common color is deep purple but it comes in a variety of colors such as blue, green, yellow, pink, rose and black. 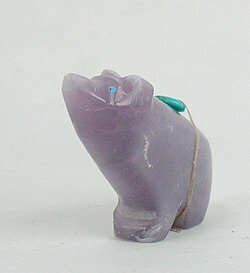 Some types of fluorite will glow under ultra violet light, hence the name fluorescence. Read more about stones . . .